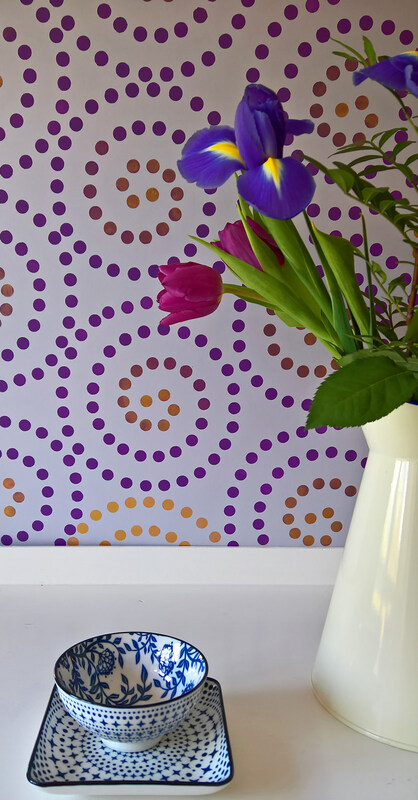 The Small Dotty Spiral Stencil – great for budget decorating! 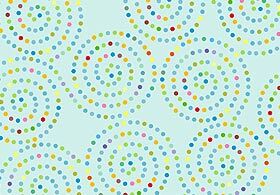 A single small dotty spiral with the approximate diameter of 20cm/8″ and two extra dots for extending the spiral. 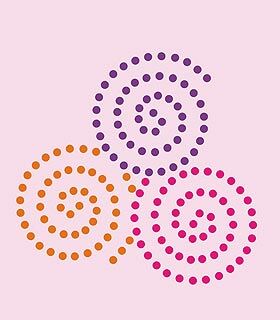 Extra dots allow you to create different types of spiral arrangements – see examples on this page. Use to create modern and impressive wall features and elegant and simple fabrics to make contemporary curtains and drapes. See size and layout specifications below. 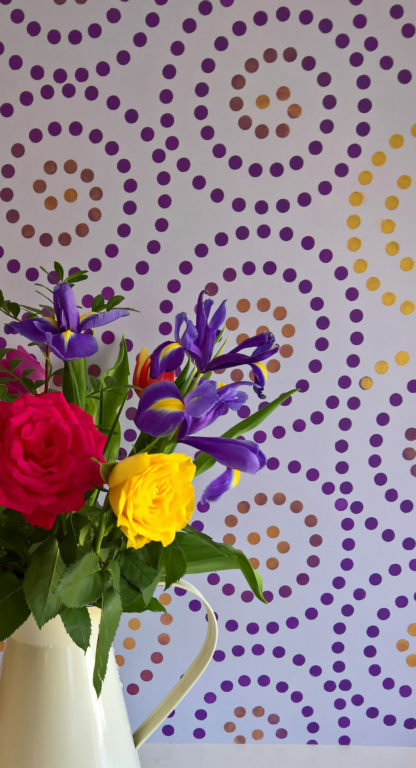 Spirals are great decorative shapes and these easy to use dotty versions will allow you to create either bold or subtle finishes depending on your colours and layouts used. 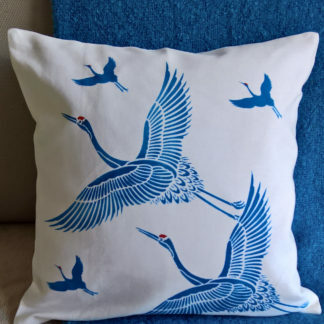 Try strongly contasting schemes and continuous pattern for intense effects or subtle close-toned colour combinations or white on pale colours for more subtle finishes. Above and top – great style on a shoestring!! 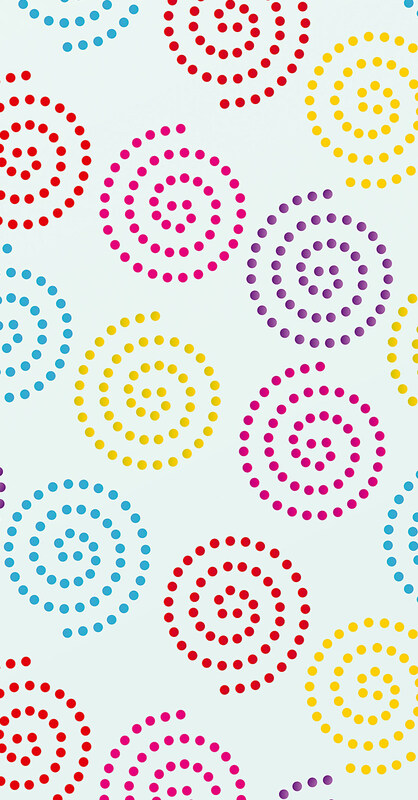 The Small Dotty Spiral Stencil has been repeated in vertical columns, using the additional dots to join each spiral. Stencilled on a pale lilac wall in Indian Purple, Agapanthus Stencil Paints and Antique Gold Metallic Stencil Paint. Above – the Small Dotty Spiral Stencil in a random diagonal pattern, stencilled in Harvest Gold, Very Berry, Cerise, Indian Purple and Paradise Blue Stencil Paints. 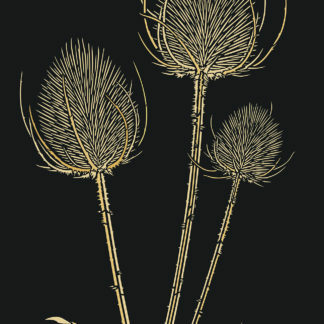 Above – stencilled in Eucalyptus, Chinoiserie, Ash Green and Verbena Stencil Paints. The spirals can be used spaced randomly apart or interlocked together or even overlapped to create all-over effects. Or simply use the spirals repeated regularly in rows to create borders or strong geometric patterns and shapes. 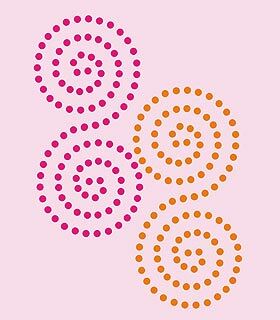 To overlap the spirals simply use masking tape to mask off the dots on one of the overlapping spiral sections – this will immediatley make it appear as if it is behind the first spiral. Or simply use the spirals repeated regularly in rows to create borders or strong geometric patterns and shapes. 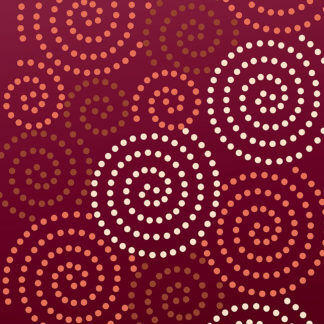 Above – the Small Dotty Spiral Stencil stencilled in an asymmetrical diagonal pattern. Stencilled in Ice White on a lilac background. 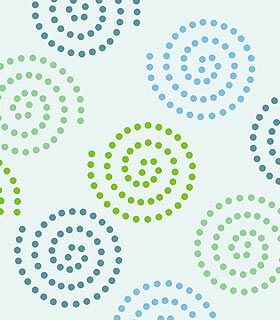 See also the larger Oversize Dotty Spiral and the Dotty Swirls Theme Pack and circle stencils the Dotty Circles Stencil Theme Pack – as well as the Circles Theme Pack Stencil and Outline Circles Stencil. 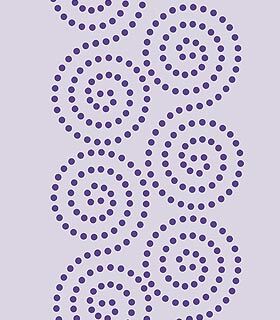 Above – the Small Dotty Spiral Stencil in a random adjoining sequence in French Lavender and Indian Purple Stencil Paints on a pale aqua coloured background. 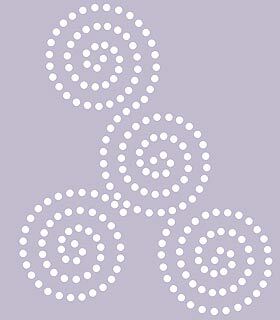 Above – the Small Dotty Spiral Stencil in Ice White Stencil Paint on a lavender backgound. 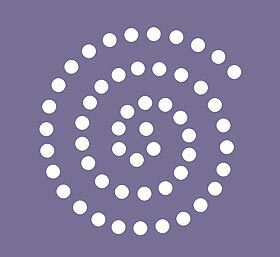 Above – the Small Dotty Spiral Stencil stencilled in an open repeat in Ice White Stencil Paint on a pale lavender background. 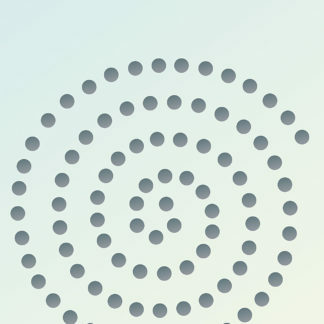 Above – the Small Dotty Spiral Stencil in an overlapping sequence. To overlap the spirals simply use masking tape to mask off the dots on one of the overlapping spiral sections – this will immediatley make it appear as if it is behind the first spiral. 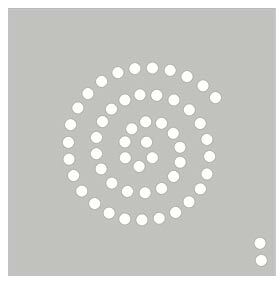 Below – the Small Dotty Spiral stencilled as a connected pair – the first stencil is stencilled upright and the second is rotated 180 degrees and joined to the tail of the first. Both designs stencilled in French Lavender, Cerise and Indian Purple Stencil Paint on a pink background. 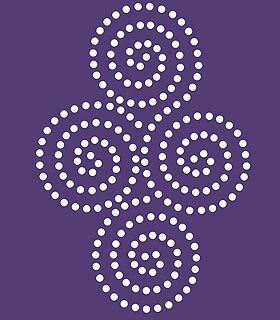 Above top – the Small Dotty Spiral repeated as a striking diamond formation, stencilled in Ice White Stencil Paint on a purple background for a strongly contrasting finish. 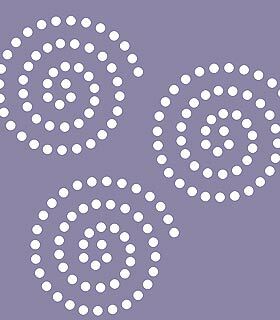 Above – the Small Dotty Spiral stencilled in a vertical pattern with a series of connected pairs stencilled in Agapanthus on a pale lilac background. To create the pairs – the first stencil is stencilled upright and the second is rotated 180 degrees and joined to the tail of the first; repeat the process vertically. 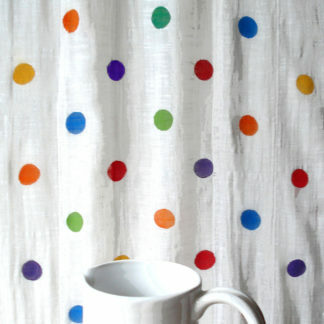 The extending dots are used in this design. 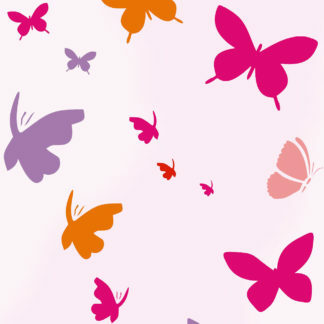 Above – this effect is great on floors and walls. 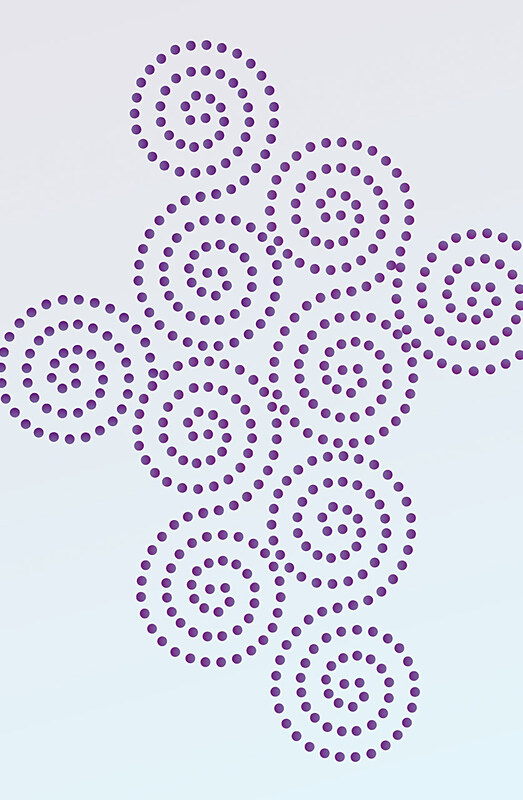 The Small Dotty Spiral rotated and repeated in an interlocking ‘swirly’ sequence using the two extending dots to join the spirals together. Stencilled first in Spearmint and Chinoiserie Stencil Paints on a pale aqua background. Then over-stencil random dots in Very Berry, English Rose, Indian Purple, Agapanthus, Chinoiserie, Verbena, Buttercup and Harvest Gold. This is then repeated in the same formation in each spiral. Any bright random colours will do for the second set of colours. You can also use the Oversize Dotty Spiral Stencil to achieve this effect – especially good for larger areas. This single sheet stencil is made of 125 micron mylar. The spiral also has a separate row of two dots on the same sheet for extending the end of the spiral to create joining and looping designs. The diameter of each spiral is 20cm (8″). The dot size is 13mm (1/2″). On a sheet 33cm (13″) square. Left the single sheet of this stencil, showing the additional dots for extending the outer end of the spiral. Henny Donovan Motif was established by the London based author and designer Henny Donovan (BA Hons). Henny set up Motif in response to interest and demand for her original designer stencils. Her stencils, own-brand paints and useful equipment are available for purchase through this website, which operates a worldwide mail order service. 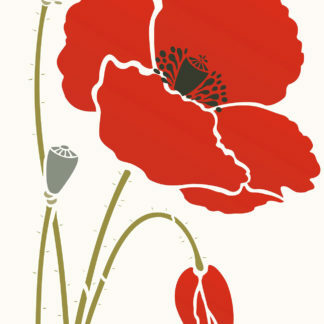 Henny's designs are modern and up to date, born of her intricate, detailed drawings and close observational work. She has created designs that are totally original and Henny's creative ethos has lead to a range of new, interesting and well-drawn stencils, totally different from the mass produced, computer generated designs generally available. 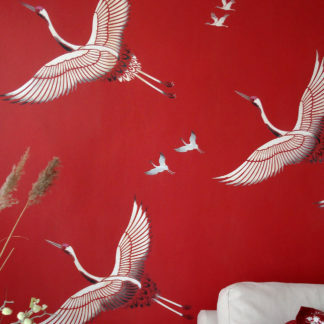 As well as her fine art drawing skills, Henny has used her expertise in textile design to create innovative, exciting repeat stencil designs, enabling home decorators to produce their own hand-printed wallpaper and fabric finishes. Copyright © Henny Donovan and Henny Donovan Motif. All rights reserved. Henny Donovan/Henny Donovan Motif is the sole copyright owner of all stencil designs, photographs and text published in this website and as such are protected by copyright. Copying of stencil designs is strictly prohibited. No design, stencil, photograph, text or part therein, may be reproduced, stored in a retrieval system or transmitted in any way or by any means, electronic, mechanical, photocopying, recording or otherwise, or re-used, or sold by any person without the prior written agreement or permission of the copyright owner.